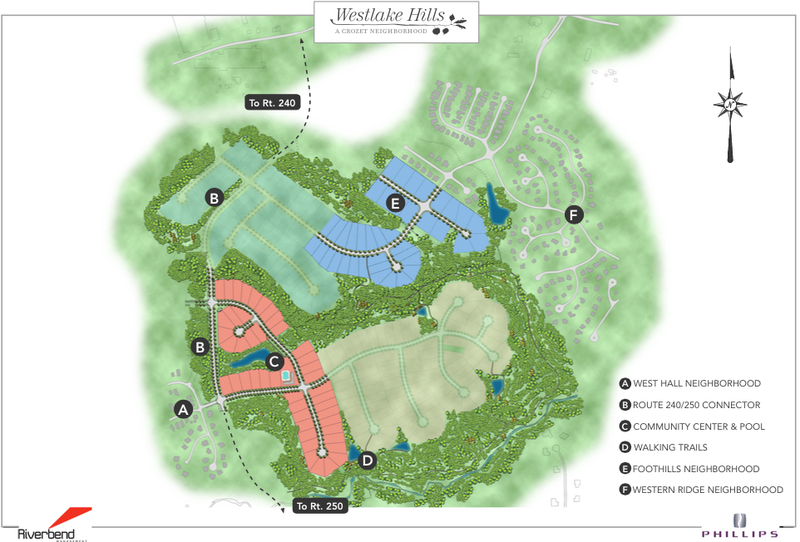 About three years ago, Westlake Hills was announced. They’ve been pushing dirt behind Westhall for some time, but just this week, the developer emailed me the plats and site plan renderings. 1) It’s a new development in Crozet that naturally generates conversations and questions. 2) I’m hopeful the Eastern Avenue will get built someday (thank you, Charlottesville Tomorrow!) – the traffic on Tabor and High Street are going to get worse. 3) I do happen to be a Realtor, and I’d be happy to talk to anyone interested in building here. 4) Seriously, look back at the conversation from 2012; it’s awfully good and it’s a reflection on how little has changed, infrastructure-wise in Crozet. If you’re curious to see what Westlake Hills may look like (lot sizes and more) here is a site plan, a marketing map and the Foothill Crossing overall site plan/map. And if you have questions about houses, price points, timelines, please ask me.